Looking for fun meeting ideas in Venice to get your team excited? When the average employee is asked to attend another meeting, the usual response is to fake a “scheduling conflict.” That’s because most meetings are not considered “fun.” Injecting fun into your meetings might be the thing to encourage participation. You want to make your meeting powerful and entertaining so that your team looks forward to going. 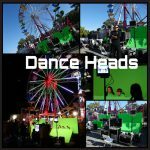 Dances Heads is a new, innovative, funny, and mesmerizing form of entertainment in South Florida. Dance Heads captivates audiences and participants of all ages. Participants’ heads are superimposed on the bodies of professional dancers in a video. Participants can sing along and bob their heads to great pop hits! Guest can do it alone, as a duet, or as a trio. Dance Heads is not lip syncing or karaoke, but an animated method of imposing your face on some great dancing! With Dance Heads, you can create an event that guests will never forget. Great corporate events and meetings! In addition to the entertainment, Dance Heads offers you a way to spread your logo and branding. Each participant instantly gets an email file that features the video with your logo. Statistically, Each Dance Heads Video is seen by Approximately 47 people in a 3-month period. Participants that receive the video via email share it instantly with their contacts and on social media. WOW Imagine the chance to brand each performer with your info, or have an inset company logo imbedded in the actual Video with all inquiries coming back to you giving you the opportunity to gain new clients. Contact Dance Heads today at 941-544-5753. Bradenton, Lakewood Ranch, Longboat Key, Lido Key, and Anna Maria. Sarasota County: Sarasota, Siesta Key, Osprey, Nokomis, North Port, Venice, South Venice.